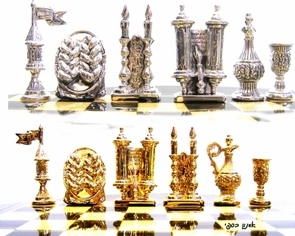 Unique Sterling Silver Shabbat Shalom Chess Set Innovative unique large 925 sterling silver Shabbat Shalom chess set. 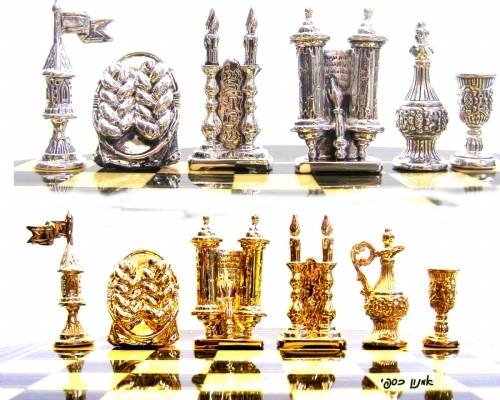 Comprised of 32 highly detailed and outstanding Shabbat style pieces, 16 made of sterling silver and 16 made of gilded sterling silver. 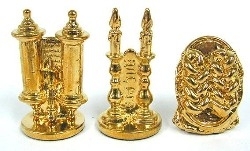 The kings are designed as Torah Book, the queens as Mother praying, the rooks as Besamim buildings, the knights as the symbol of Vase for Wine, the bishops as Chala and the pawns as Kiddush Cup. The wooden board is set with a silvered and gilded metal playing board. This set was made in the electroforming method.